This entry was posted in Skip Allen & Painter 12 and tagged Corel Painter 12 Tutorial Video, Corel Painter 12.1 Webinar. Bookmark the permalink. I really enjoyed your Webinar. I just bought a Wacom Intuos5. Since I’m new to Painter, it was good to learn some things about brushes. BTW what was the name of that wonderful oil brush you were using? I knew you have bought the intuos 5. I saw your blog post about it. I like your blog very much and enjoy reading what you have to say. I love that you keep so active. I think the brush was the Den’s Oil > Funky Chunky. I thought they were available at Painter Talk, but I just looked and didn’t see them. You should be able to find them…just google Den’s Oil Brushes. It may have been one of the Bristly Dabs. Your best bet is to download the video and view it again. Thanks Skip for your kind words about my blog. I will watch the webnar again, because there was so much information that I need to sink in. Also I will check out Den’s brushes. Marilyn Sholin gave the link to her site and you can get Den’s brushes there. Look at Marilyn’s comment in this thread. Skip… enjoyed your webinar immensely, only problem is, an hour just isn’t enough! I couldn’t believe how fast it went. I know you had a lot more you wanted to input but that darn clock was too fast! Looking forward to your next one. LOL…you don’t want me to keep going, trust me. I am verbose. I could easily go another 4 hours. Seriously, thank you so much for the nice comment. See you in the next webinar. Thank you Skip! Great Webinar. You answered some questions that I didn’t even ask!. How cool is thatI Look forward to the next one. Great Melvin…LOL…we will have to figure out how I answered unasked questions and repeat it for the next webinar. Thanks for coming. It was a very good Webinar Skip. Though I’ve heard you say it all before during class it helps to hear it again and each time a bit more sticks in my brain. Thanks Gary, I think it is important to repeat stuff in general. I suspect I will have to have a basic time in each webinar. A time for review of basic function of Painter; for many it will be the first time they have heard of the function. You are more than welcome dear friend. How is the MAC comming along…has it been cleaned up and is running again. This was a very helpful review. I liked the way questions were handled. It seems to make it easier to stay on course of with topics. Very easy to follow along. What a great service you provide. Thank you. I am glad to know that it the webinar was easy to follow. I need this kind of feedback in order to tweak the process. You comment was very helpful. Skip your webinar was just what I was hoping for, a Hodge-Podge of basics and dipping into some more advanced stuff. Little to nothing to suggest. You might of quickly mentioned the saving, exporting for archival, deleting and renaming custom pallets. And when naming your download you might use length, 1h8m instead of time 1208, the length is more relevant for those of us that archive them. “Cry Me a River,” is a beautiful painting Skip. Very interesting use of color and I think unusual use of texture, harmonious is the word that comes to mind. And of course this painting shows the capabilities of these particular brushes. I just went rooting around looking for a larger version, was 1200 x 803 the original size? Oh…and thank you! Thanks for the comment Stephen. I believe the 1200 x 800 is the correct size…I seldom work larger since I don’t print. The name of the file is created by Go To Webinar and I have always left it with date. It is much easier for me to keep track by date rather than size. I think I am going to stay with date; LOL…you will have to change your file name to size. Thanks for the nice comments about Cry Me A River. Thank you so much Skip for taking us on the Painter 12 world. Your knowledge, generosity and love of teaching Painter inspire to learn. I have to watch your webinar again ……. They will need to register and will be automatically signed up for the newsletter from which they can safe unsubscribe the first time they receive it. Can I give out the link to your webinar on your blog to others? Just want to check first. 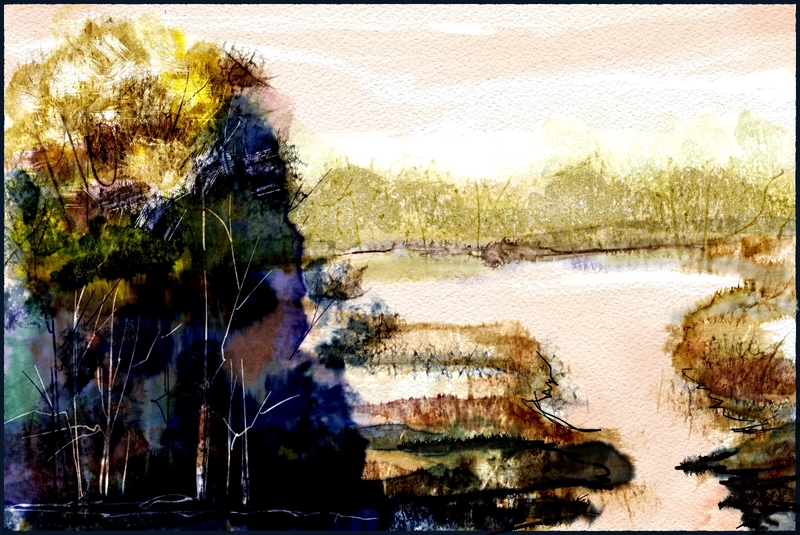 Next….I would love to have the brush settings for some of the brushes you used in the webinar. The ones you really liked using as to what the tweaks are. It’s hard to see the screen for details and starting and stopping takes so long. There was one you used I can tell you which one that I really loved the look of it. If you ever need help for a webinar I can help you also…be happy to do it! Been way too long since we talked. 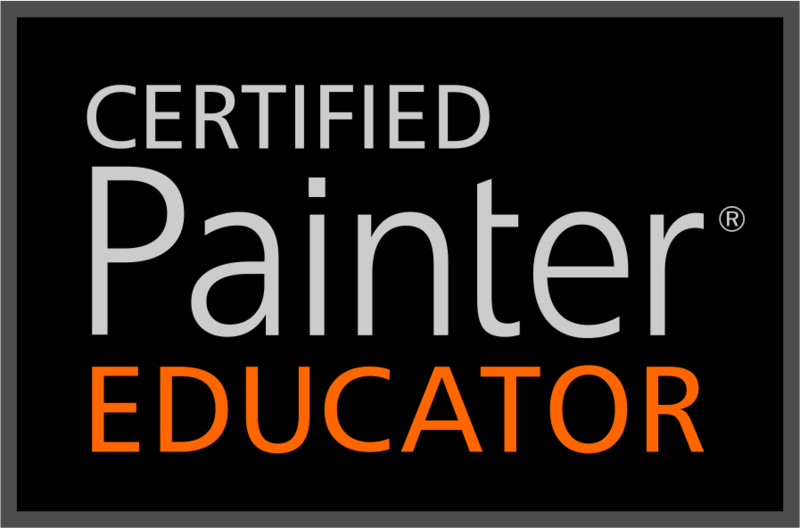 I love how every Painter educator has a different specialty and look to their work so the everyone gets the benefit of a very well rounded education. It’s like Photoshop instructors…you can take from ten of them and everyone will show you something different and new. It’s an exciting time for us all! Way too long since we talked…time to chat again friend! You are right…we have been too busy and haven’t hardly talked in a while. I miss that. Thank you so much for posting the link for Den’s Brushes. I wasn’t sure where they were. Hmmm…brush settings. I guess I’ll need to look at the video…something I seldom do…LOL. Actually your question would make a great post…so I’ll try to figure it out for you. Help with the webinars would be terrific. I would love to set one up for you to do for us. Let’s talk about that. I have been wanting to get back to bristly dabs and hope to soon…I don’t want to be a one trick pony with watercolor. Thanks for attending the webinar and for making a comment. Let’s do chat soon and work out some plans…its time for some play. My watercolor class will start again in August and I hope to have a couple of other classes started by then. I changed my 32″ screen resolution from 1920 to 1600 to achieve a 100 ppi ratio. Now your watercolor and other folks painter works look a heap more clear. Even at 200 & 300% size. I hope to take your beginning brush building course that I believe starts in August as well. Also was reading through your list of custom pallets. I don’t suppose there is a way to lock all control tabs in place so they don’t go popping out of place all the time. Customizing most any attribute on the fly is wonderful. But it does break the flow a bit having to squeeze the tiny tabs back into place all the time. I wouldn’t mind holding a modifier any time I did want to move them. Maybe I am missing something. I don’t think there is a way to lock the control tabs and keep them in place. Holding a modifier sounds like a good solution, but I think it is simply our mouse settings. I have been meaning to play with those and see if I can get it fixed. I do have better luck using my mouse when navigating around the panels than I do with either of my pens. Downloaded the Hodge-Podge Webinar video but can only see the left side of your screen. t looks like t’s expanded horizontally and you are workiing on the expanded side that I can’t see. Go to the View Menu and choose a different view…like half size and see if that helps. If it works, then you can grab the bottom right corner and adjust the size of the player to your preference. Please let me know if this works. If not…tell me your type of computer, OS, and the size of your monitor. I have the problem with Windows Media player(my default) and VLC media player I do not have that problem with QuickTime. I am working on a 30 inch screen and the videos produced seem to fit that space. But, remember, the files are MP4 files which are supposed to work in Quicktime…if that is working for you…then you are good to go. I finally got to finish watching the webinar, and it was so helpful and satisfying! You addressed issues that were confusing to me, even though we have covered them before. I especially appreciate your going over the addition of the texture layer again, and the Add Command feature. I may not be able to attend the webinars as they are presented, but you can be sure that I download and watch them (several times, probably!) Opening one of the recordings is like opening a Christmas present to me- the promise of excitement and entertainment. Thank you so much for this gift! As for future webinars, anything that you want to cover will be welcome! Thank you Candace…I really appreciate the support. I keep hoping for Webinar #2. Any plans? Yes Candace…Webinar 2 is in the works, but until it is finalized…I can’t tell you about it. But, I hope we will have a guest artists for the second webinar. If that falls through, I’ll do another one. I need a little more information. First…updating to Painter 12.2. 5. After installing 12.2 did you start Painter with a Shift Start, which is recommended by Painter. If you didn’t, please be sure to save your custom stuff and start Painter by holding down the shift key and while holding it down, start Painter. A box will show that asks if you want to set the current workspace to factory settings or All workspaces. Choose all. Now Painter will open set to the factory defaults. Now you can start bringing in your custom stuff. If you did this, then please tell me how you installed the brushes. I can’t tell if you did anything wrong or what that might be from the knowledge that they don’t work. I need to know why and I can only see that if I know the steps you took to install the brushes.